Jamie Peacock scored on his 500th career appearance as Leeds Rhinos eased to victory against Wakefield. Liam Sutcliffe, Ryan Hall, Tom Briscoe and Carl Ablett tries, all converted by Kevin Sinfield, put Leeds 24-0 up. Further scores from Peacock, Chris Clarkson and Rob Burrow helped Leeds go second in the table, while Jarrod Sammut scored Wakefield's only try. Leeds Rhinos labelled the match at Headingley "JP Day" to mark Jamie Peacock's 500th career appearance. 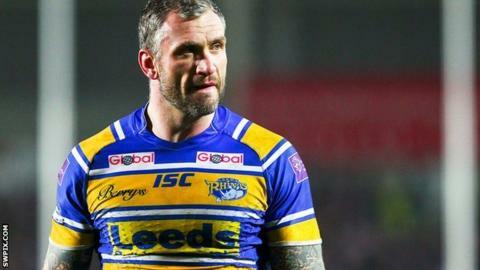 The former Great Britain captain has won eight Super League titles, four World Club Challenges and two Challenge Cups. He was named Leeds' player of the year in 2013 and recently signed a contract extension to keep him at the club until the end of the 2015 season. But there was an injury concern for the Rhinos as Ben Jones-Bishop left the field on a stretcher in the first half. The match was stopped for 10 minutes as the full-back received treatment for suspected concussion, but he sat up after being transferred to the medical room before going to hospital for scans. Wakefield suffered a costly early blow of their own, with back-rower Ali Lauitiiti limping off with a suspected medial knee ligament injury after just six minutes. Leeds had progressed to the fifth round of the Challenge Cup with a 60-6 win against the Wildcats last week, and with Sutcliffe and Hall crossing in quick succession, another comfortable Rhinos triumph looked likely. Hall and Joel Moon linked up to send Sutcliffe over for the first score of the game, with Hall then getting on the end of Burrow's cross-field kick to extend the lead. Sinfield and Kallum Watkins then combined to send Mitch Achurch free before the back-rower offloaded for winger Briscoe to cross. Wakefield rarely threatened in the first half, with on-loan Rhinos youngster Luke Briscoe's failed juggled effort the closest they came to a breakthrough. Leeds continue to pile on the pressure, forcing three goal-line drop-outs before Ablett finally crashed over the line. Peacock marked his milestone occasion with a rare try after the break, 15 years to the day after he made his senior debut against the very same opponents. Sinfield converted and then set Clarkson up for his try, before Paul McShane burst through Leeds' defence to send Sammut over for the visitors' only score. But Burrow then ran in the hosts' seventh try, with Sinfield competing a perfect night with the boot. "On the way here I was getting a little bit nervous and I was just thinking: 'What are you doing? It's just a normal game, just crack on with it'. "It was really enjoyable. It's been a humbling experience. I've had a lot of kind messages from people, and it's been really nice to receive them. I'm grateful. "He [Peacock] has had an outstanding career. I'm very envious and I think most players are. I know it hasn't been easy for him and he has had a few setbacks. "Just by sheer determination and hard work he has got through, and that's not because of talent or speed or something that he was gifted with. It's through hard work so he should be very proud about what he has done." "It is easy to judge by the scoreline, but I thought our effort was much better. "We were beaten by a team, whether we like it or not, that has got a lot more talent than us. "Ali [Lauitiiti] is very much a go-to man for us. To lose him so early in the piece was a blow and I think we are probably going to lose him for a while now." Leeds Rhinos: Jones-Bishop; Briscoe, Watkins, Moon, Hall; Sinfield, Sutcliffe; Leuluai, Burrow, Peacock, Ablett, Achurch, Kirke. Replacements: Bailey, Ward, Singleton, Clarkson. Wakefield: Sammut; Fox, Briscoe, Ryan, Riley; Sykes, Godinet; Anderson, McShane, Scruton, Lauitiiti, Kirmond, Washbrook. Replacements: Siejka, Raleigh, Moore, Annakin.